I have to wonder if the public announcement by Prime Minister Tony Abbott that he is a “feminist” was a ploy to win over women or a ‘stuff you’ moment to the many women who have challenged & criticized him. That such a statement was made at an International Women’s Day Event was breathtaking in its arrogance. Either way, it demonstrates a complete lack of understanding of both the purpose & history of International Women’s Day as well as a lack of understanding of the basic principles of feminism. What a ridiculous statement. Abbott refers to a handful of women who have had various measures of success in attaining prominent public roles. The success of a few women does not mean that gender equality has been achieved for all women. Abbott also fails to acknowledge his own role in the public abuse & humiliation of Australia’s first female Prime Minister, Julia Gillard. When one woman is abused and degraded, all women become vulnerable targets. 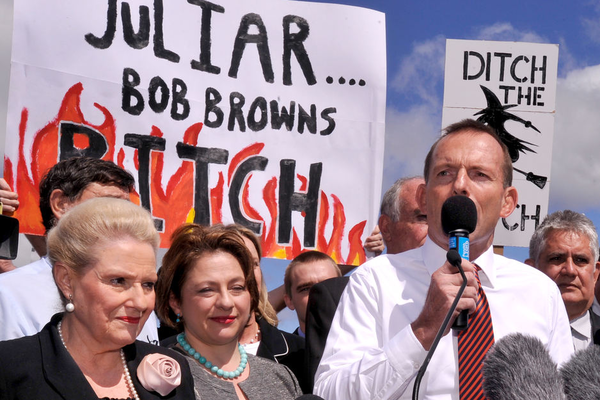 When he chose to associate himself with Ditch The Witch mantra and stood under those offensive signs on at least two occasions he well and truly earned himself the title of Australia’s Prime Misogynist. As for smashing the glass ceiling, there are tens of thousands of Australian women who can’t even see the glass ceiling let alone smash it. So much work still needs to be done in this country to further advance the social, political and economic status of women. So many women are still being left behind including Aboriginal & Torres Strait Islander Women, Migrant Women, Women with Disabilities, Homeless Women and Women as Single Parents. So much work still needs to be done to address violence against women in both public and private spaces. Lifting women out of poverty still presents many challenges. Many things here that Tony Abbott could have spoken to. The political, social and economic advancement of women has been at the core of the women’s movement for over a hundred years. This work has many faces and dynamics. The work of feminists may differ in causes, goals and cultural context but the essences is always the further advancement of women. 2) A pay rise for 30,000 child care workers was axed. The predominately female workforce had lobbied for increases which ranged from $3 per hour for childcare workers to $6 per hour for early childhood teachers. 3) A promised pay rise to 350,000 workers in the aged care sector was also axed Again an industry which employs a large number of women in part-time positions. 6) Nothing has been done to address the enormous gender gap within superannuation which sees women retiring with 33% of the amount payable to men. 7) Nothing has done to address the enormous social, political and economic disadvantage of Aboriginal & Torres Strait Islander women as well as Migrant Women. These are by no means an exhaustive list of the gender inequities with Australian society. Violence against women in all its manifestations continues to be a largely untold story. The fact that “one punch can kill” is the reality for women in the home not on the streets is seldom mentioned in the current discourse on violence. We would rather speak to young women about their drinking habits than speak to young men about respect & sexual consent. Women are dying from domestic violence in what should be preventable deaths. Of course there are male politicians and male community leaders who are working to address these and many other issues. And yes many men have been walking alongside women for decades in their struggle to gain justice and safety. Tony Abbott has not earned that badge. By appointing himself Minister for Women and announcing himself as a “feminist”, Abbott has taken ‘charge’ of women’s issues shutting down and shutting out women’s voices. Patronising in the extreme. Maybe he should consider some of the many readings of John Stuart Mill 1806 to 1873 including the Subjection of Women. Mill was a political leader who earned the right to call himself a feminist. 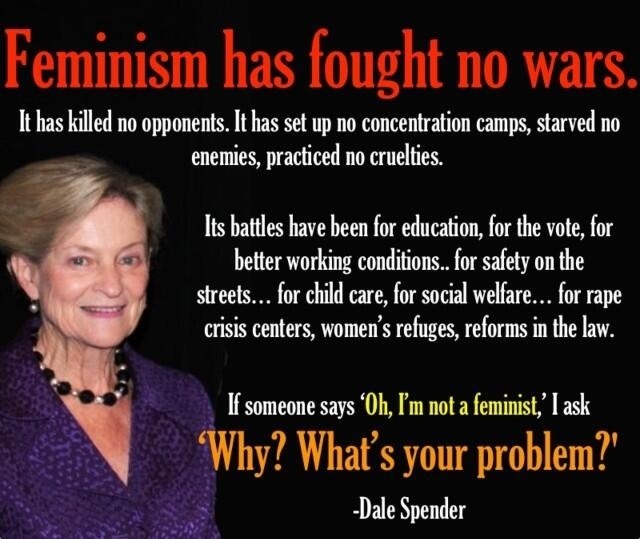 I have always been proud to call myself a feminist. I honor the women who went before me & the struggles they had to achieve so much for women. How easy it is to take for granted many of these hard fought gains & benefits. I applaud the work of today’s feminists who still continue to work to make society a fairer, safer & more just society for all. IWD provides an ideal time to reflect on what we are doing to make our corner of the world safer and fairer. This entry was posted in Feminism, Politics, Uncategorized, Violence Against Women, war on Women. Bookmark the permalink. He doesn’t advance the cause of women’s one bit. The cranky part of me asks why would you even invite him to speak at IWD?? Wonder how many women walked out. Women need to call him out..were more than willing to do it continually with Julia Gillard. Well said Bettsie. Its the mixture of power and delusion that’s the biggest concern. Thanks for sending your article over Bett….it was tremendously stirring & sad at the same time – how women have suffered at the hands of many an ignorant,cruel partner,boss ,society &/or political leader like the arrogant ,misogynist PM we have now.How dare Abbott call himself a Feminist,it is an honoured role & yes he is completely delusional ,& many women are outraged,know I am,to hear him claim this – he has never prized the work,struggles & valuable imput of women& never will ….but women & their outstanding contribution will endure …& Abbott will not!Hope to celebrate Abbotts demise with you in the near future Bett!Amazing piece,mate. Wonderful work Betty. I remember reading it, “like”ing and planning to come back to comment! Blame it on the morphine! 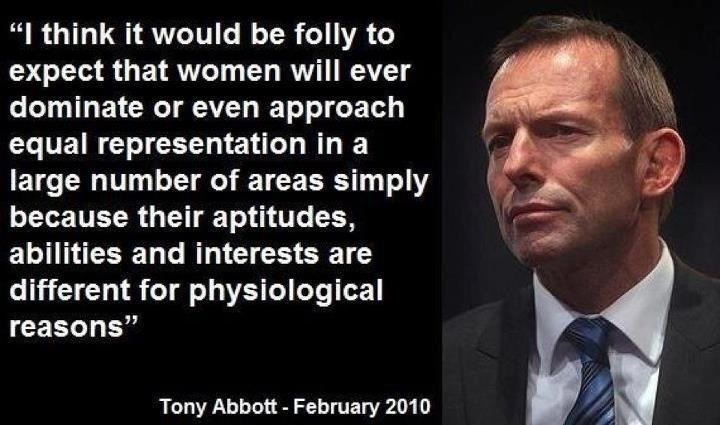 Abbott has as much feminist juice as the Henry VIII in my view. I don’t believe he hates women in any pathological sense, he quite simply believes women should be ironing or barefoot and pregnant in the kitchen. It astounds me mostly because my father, born in 1921, was far more liberated than Abbott. How can this be?